There are many ways to setup your machine for this process. A US Digital MA3 shaft encoder for analog or PWM laser modulation timing belted to the Z axis stepper would allow the Z axis down movement and laser modulation at the same time, but they would be synchronized together. A variable feedrate can be used also. Or, you can use a switch for different stepper motors. Set the Z axis focal height, then switch to the MA3 stepper to control the laser modulation with Z axis commands. A variable feedrate can be used also. Or, you can use a DAC or a MA3 as a 4th axis. Z axis down movement commands & A,B or C axis laser modulation commands can be set independently, but still on the same line of gcode. You can also vary the feedrate. There are other options and somewhat similar, but they are out of Mach3's ability. It consists of using X, Y axis moves and then S commands for the laser's modulation. A variable feedrate can be used with it also. You can try just using a variable feedrate, but by using both variable laser power and variable feedrate combined together, it gives you more control of the outcome as you can see in my examples. Thanks for explaining it, Jeff. Z height will produce better. (When installing use the advanced options unless you want to install the unwanted toolbars etc or else download the portable version). This program is capable of producing some quite stunning results and in some ways can be better than the Photochop plugin I have been using to date. 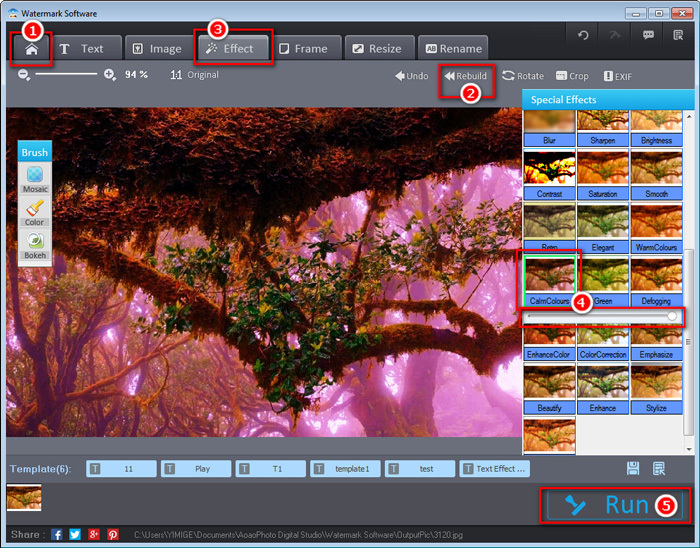 To prepare photos well, another photo post processing goodware is image filter editor, which supports fast adding photo protections as well as well editing. Hey. Greeting from far away! I'm from Belarus from the city of Minsk. Sorry for my bad English. I use google translator. For half a year I have been studying the theme of a solid-state laser. I did a lot of experiments and achieved good results. I have a channel on youtube. There is a video about my progress. I can post a link to the video only with your permission. You're the master here) I read almost all of the 97 pages of this topic - using an interpreter. I even began to understand the humor on the forum) Your projects are everywhere) Everything is pretty well written! Thank you for your work. I managed with your help to run the plugin Engraving DLL v1.2s - works fine. Thank you ! But there was a problem. Laser power adjustment is required, and in this plug-in this is not possible. I need laser engraving on natural skin. And there it is necessary to regulate the depth of the burn. Moreover, the plugin does not behave correctly on my machine. It makes a move to the right, then immediately to the left, and then a pause of about 500 milliseconds. This greatly slows down processing. What G code is used in the plugin - I have not found it anywhere. Therefore, I can not edit it. I realized that the principle is based on changing the pulse frequency of 40 microseconds in length. Do you have a G code from the plugin for example? To understand his work? I tried changing the processing speed and accuracy to 0.1 millimeter. But this is not enough. I tried to create my G code with DotG v0631. I tried to manually adjust the laser power. This also did not work ... I still did not understand how to check whether my Mac3 sees the commands M11P1 and M10 P1. Is it correct? My machine brakes at each of these points. How can I check whether the M10P1 and M11P1 commands work? How to create a normal code with M10P1 / M11P1 commands? Of course I want the best of options. To control the laser power at each point of burning. I read a lot of your articles. And I saw that you use command C *** for power adjustment where S0 is 0% power, and S1000 (or S100) is 100% power. But as soon as I add the S *** command - the CNC machine starts working slowly at once. It's strange why this does not happen when working with a palagin. What does your G code look like? Show me your example. Conclusion. The plugin works fine, but there is no power adjustment and pauses in 500 microseconds. M10P1 b0 and M11P1 b1 I think they do not work for me. The control of the spindle command (PWM) slows down the machine. You would have helped me a lot. The plugin delay, after the movement to the left, is something I have been meaning to correct but, like so many other things, it never happened – perhaps one day I will do it. You can make a reduction in this delay by operating the plugin in constant velocity mode. The plugin writes directly to the Mach3 engine so no separate Gcode is available for viewing or editing. The plugin uses a constant 40uS pulse width (this does not change) it is total number of pulses per pixel (determined by the pixel value) which regulates the laser power or burn. Thanks for the nice reception on the forum! Thanks for the link to Mach3Version3.043.062. I was looking for an older version with respect to .066, but I did not find it. Soon I'll try it in action. By plugin. I have a fixed speed. But this does not take away the delay. The plugin program is good. It's a pity there is no tuning of the power of burning. But with control via the virtual axis B nothing happened. More precisely, the virtual axis itself works. But the CNC machine still works jerky. The article you dumped - I also read and translated. But I do not really understand how the virtual B axis changes something. It seems to me that DotG does not correctly calculate the X axis movement. Maybe you have an example of a working code - which works fine without jerking. I can try it for myself. True, I have a limited desktop size of 200x450 millimeters. The DotG X axis motion is 'stop-start' so, in operation, it will be 'jerky'. This can, top some extent, be reduced by selecting a suitable feed-rate / Acceleration. The 'virtual B axis' movement is necessary to trigger the M10 / M11 commands whilst the X axis is stationary (the M10 / M11 commands will only take effect at the instant of an axis movement). I think it was here that I saw someone who used the Z motor coupled to an encoder to do analogue control of a laser power. Wanted to review his work and try to implement this idea for impact engraving. Do you remember who it was and do you have some reference?